"We claim for ourselves every single right that belongs to a freeborn American, political, civil and social; and until we get these rights we will never cease to protest and assail the ears of America. The battle we wage is not for ourselves alone but for all true Americans. It is a fight for ideals, lest this, our common fatherland, false to its founding, become in truth the land of the thief and the home of the slave -- a byword and a hissing among the nations for its sounding pretensions and pitiful accomplishment." I also could discuss how the Bookerites worked diligently to minimize the influence of the Niagara Movement in the black communities. They sought to delegitimize the organization by cutting off its funding sources. This action by those followers of Booker T. Washington, was a resounding blow to securing black unity in purpose or goal to achieving our people’s elevation across our communities in this nation. Oh I could also discuss the hereditary linkage between this man and the writer of this nation’s Declaration of Independence as well as third President of the United States, Thomas Jefferson. He being a direct descendent of Mary Hemings another concubine of Jefferson. Mary Hemings, Sally Hemings sister also borne Thomas Jefferson’s children while in the bonds of her master’s chains. Mary and Sally Hemings were half-sisters to Thomas Jefferson’s wife Martha Skelton Waynes, who in fact was Thomas Jefferson’s own cousin. Oh what a tangled web we weave, when we think we can deceive. Although maybe it was that revolutionary strand of Jefferson that directed the actions of this great man. Wasn’t Thomas Jefferson a true patriot and revolutionary? That’s what I was taught in the history books although there was absolutely no mention of the entangled sexual web that Jefferson was spinning at Monticello. If you haven’t guess quite yet who today’s blog focus is on. 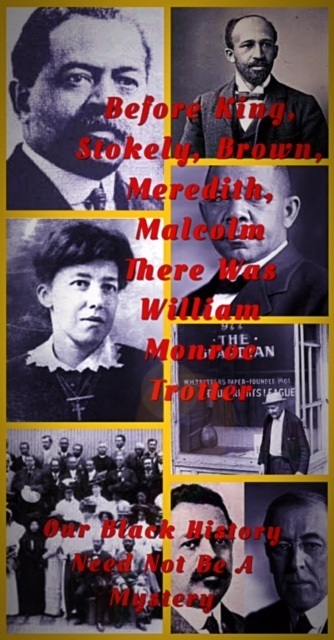 I will end the mystery, William Monroe Trotter, possibly the most intellectual black agitator of the early 20th Century period for Black Americans. This incredible ancestor who could have chosen to live a life of total comfort decided early on that it was his responsibility to move our people to levels of complete citizenship. I can hear these words coming from his lips with complete and utter defiance. Monroe Trotter, was the first black person to earn the coveted Phi Beta Kappa pin for intellectual excellence. He was educated in banking and finance at Harvard University. Although he was not allowed to pursue his banking interests in the white community. You can be assured that he would’ve been a financial wizard in the communities of color. Yet, William Monroe Trotter had a rebellious, combative streak in him that demanded direct and immediate action against injustice. Wasn’t it Trotter who directly confronted Booker T. Washington’s philosophy of accommodation at a speech in Boston that ended in Mr. Trotter being jailed for his actions. William Trotter was not about waiting for his or his people’s freedoms. Wasn’t’ that freedom promised in every document of this country’s constitution and secured by the 13th, 14th, and 15th amendments? Why should we bow down to oppression? The oppressor surely doesn’t respect anyone unwilling to fight for their own independence, does he/she? Wasn’t William Monroe Trotter radicalized long before anyone ever heard of H.Rap Brown, Malcolm X, Elijah Muhammad, or Stokely Carmichael? I mean he was an advocate of the teachings of a radical Jesus Christ who demanded justice through direct action. Didn’t William Monroe Trotter split away from WEB Dubois because Dubois demanded white participation in financing as well as leadership. While Mr. Trotter felt that only blacks could truly solve black issues. He was one of the very few black men who was intellectually on par with Dubois. So his opinions had to be respected by Dubois even if Dubois could agree with them. “Mr. Monroe Trotter. Mr. President, we are here to renew our protest against the segregation of colored employees in the departments of our National Government. We [had] appealed to you to undo this race segregation in accord with your duty as President and with your pre-election pledges to colored American voters. We stated that such segregation was a public humiliation and degradation, and entirely unmerited and far-reaching in its injurious effects. . . .
President Woodrow Wilson. The white people of the country, as well as I, wish to see the colored people progress, and admire the progress they have already made, and want to see them continue along independent lines. There is, however, a great prejudice against colored people. . . . It will take one hundred years to eradicate this prejudice, and we must deal with it as practical men. Segregation is not humiliating, but a benefit, and ought to be so regarded by you gentlemen. If your organization goes out and tells the colored people of the country that it is a humiliation, they will so regard it, but if you do not tell them so, and regard it rather as a benefit, they will regard it the same. The only harm that will come will be if you cause them to think it is a humiliation. Mr. Monroe Trotter. It is not in accord with the known facts to claim that the segregation was started because of race friction of white and colored [federal] clerks. The indisputable facts of the situation will not permit of the claim that the segregation is due to the friction. It is untenable, in view of the established facts, to maintain that the segregation is simply to avoid race friction, for the simple reason that for fifty years white and colored clerks have been working together in peace and harmony and friendliness, doing so even through two [President Grover Cleveland] Democratic administrations. Soon after your inauguration began, segregation was drastically introduced in the Treasury and Postal departments by your appointees. President Woodrow Wilson. If this organization is ever to have another hearing before me it must have another spokesman. Your manner offends me. . . . Your tone, with its background of passion. To say that Monroe Trotter was a man with definite principles is indeed an understatement. He and his wife, Geraldine Pindell Trotter, never had children, but they did indeed have a child, The Guardian, published in the same building as William Lloyd Garrison’s Liberator. This weekly spoke truth to power and was the measured voice of Monroe Trotter. They gave up the possible luxuries of life to ensure truth was always on the scaffold bending towards justice. Today I didn’t want to simply talk historically about William Monroe Trotter. I also wanted to include some of my personal thoughts. I would’ve loved to have had the opportunity as I had to listen and be in the audience of some of our most outstanding leaders. Yet the more we learn about the compassion, tenacity, determination, grit, defiance, never yielding attitude of William Monroe Trotter, the more I wished that our ancestors had not fear his combativeness. It has been said that measure of a man’s worth is how he is remembered the time of his passing. The following quotes were spoken by the leading voices of our community when William Monroe Trotter passed away on his birthday April 7, 1934 at the age of 62. “Is it not worth something to a race to have produced one such self-sacrificing soul who has held the keen edge of passionate protest for two-fifths of a century? He has stood steadfast and unmovable. He has been true to his inner light, from which there has been no varying or shadow of turning.